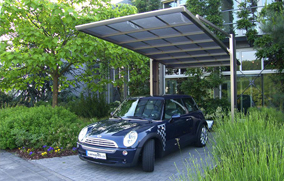 Uniport covers are freestanding and architecturally stunning, they maximise use of your outdoor space all year round. THE UNIPORT OUTDOOR COVERS ARE MADE IN JAPAN AND ARE NOT COPIES. 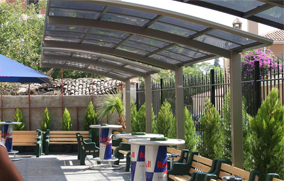 Create Stunning Outdoor Spaces – Uniport covers are ideal for creating beautiful outdoor areas. Avoid Sunburn – The Uniport polycarbonate roofs help protect people and property by cutting 99% of harmful UV rays. Enjoy Cool Shade – Uniport covers cut 75% of heat rays so you can avoid uncomfortable heat while still letting lots of light in. Dry Outdoor Living – Read the newspaper, eat and entertain without the worries of rain or drizzle. Add Value to Your Property with Beautiful Form and Function – With posts on one-side only, the fully cantilevered design looks great and gives you the freedom to move, without creating a dark space. New Zealand’s Most Affordable High Quality Covering Systems – The Uniport is surprisingly more affordable than equivalent market alternatives. Protect Your Belongings – Keep your entranceway dry or safeguard your vehicles from rain, wind or shine. No Safety Worries – The Uniport polycarbonate is 250 x stronger than glass, giving you total peace of mind of safety. Request to see one near you. Uniport covers are both modular and custom made. This means you get the best of both worlds – cost effective, proven and stylish modular designs, and custom made options to meet your specific requirements, whether residential or commercial. 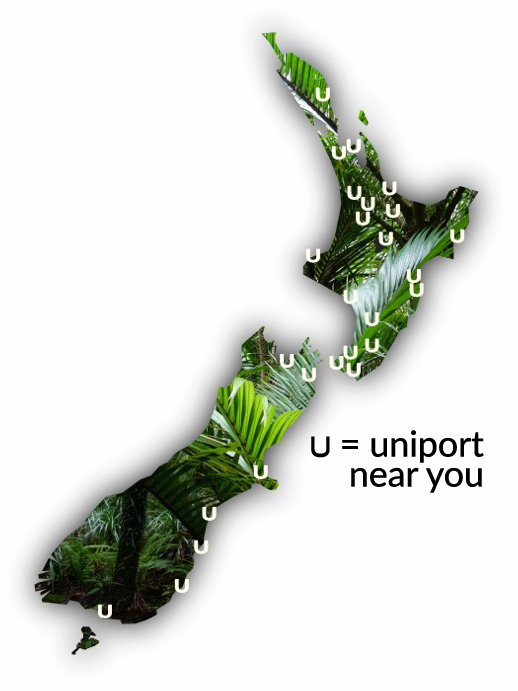 Uniport covers are designed and built in Japan – a country with typhoons, earthquakes and snow loads far greater than what we experience here in New Zealand. 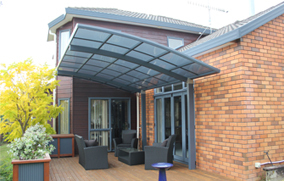 Uniport covers use solid sheets of thick polycarbonate that is 250 x stronger than glass. The high-grade aluminium frame and stainless steel fixings means a Uniport will not rust, rot, corrode, fade or discolour. Uniport covers have been perfected over 25 years and are designed to last in storm conditions, up to 145km/h. 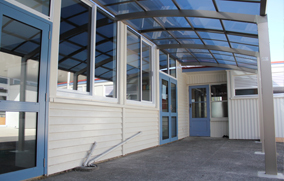 They have been Structurally Certified by a New Zealand Chartered Professional Engineer. No New Zealand Uniport has ever blown away. Uniport covers don’t squeak in the wind. Unlike other covers, all Uniport joins are sealed and isolated with a 4-point rubber system so you can be sure of a silent cover. Uniport roofs cut 99% of UV and 75% of heat rays. 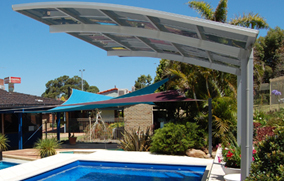 By Cutting 99% of direct UV rays Uniport covers help you to be sun smart. Uniport roofs still let lots of natural light through so you won’t be left sitting in the dark. Uniport covers are maintenance free! Each Uniport is made from corrosion-free anodised aluminium, solid polycarbonate sheeting and stainless steel fixings they require no maintenance. The slope and smoothness means that dirt and bird droppings are naturally washed away when it rains. Uniport covers don’t use cheap, unsightly corrugated plastic or twin wall polycarbonate that fogs up and collects dirt. There are no unsightly joins and no overlaps; therefore none of that nasty dirt build-up you get in other systems. Uniport covers do not jeopardise your building’s weather-tightness integrity. The cantilevered design is fully self-supporting and requires no fixings or connections to your building. A single Uniport is usually exempt from needing building consent as they are under 20m2. Resourse consent may be required if you are placing your Uniport in close proximity to your boundary, check with your local council for specific regulations. The Uniport comes in a range of standard colours, with champagne being the most popular colour. They can also be powder coated to a colour of your choice – get in touch to choose yours. 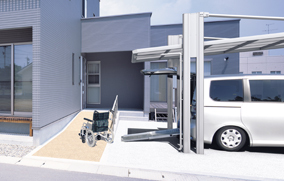 Zero overhang at the rear means the Uniport posts can be placed right up against a building or other structure. The longitudinal rear beam has been ingeniously designed as a ‘U’ channel section doubling up as the guttering. The discreet downpipe has a removable elbow for easy cleaning in the unlikely event of a blockage. A Uniport Adds Value to Your Property with Beautiful Form and Function! Your Uniport can be DIY installed from a kitset or installed by our team of experienced installers. When you order a DIY Uniport kitset we deliver you a tight knit pallet (3x1m) that can slip into your garage so you can choose when to install it. Your kitset is complete with our simple step-by-step line drawing instructions so that you can’t go wrong when showing off your DIY. All holes are pre-drilled ensuring a hassle free and fun day for the whole family. Make use of our 50 years of combined building experience and get your Uniport installed in just 1 day. 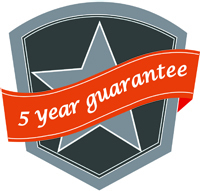 We offer an obligation free site visit to give you a firm quote plus our workmanship is fully certified and guaranteed for 5 years. We can reinstate decking, cut and re-lay concrete and move plants. The team will always go the extra mile to ensure your Uniport is installed on time and we use our combined experience and initiative to make certain you’re getting the best from your Uniport! We behave like invited guests who respect your home and neighbourhood. “We had an exposed area in the driveway that needed a nice cover. We chose the Uniport Kitset and installed it ourselves. It was good fun, easy to install and we love the shape/style as it suits our house PERFECTLY! © 2015 - 2018 Uniport. All rights reserved.